Policing an Occupied Legislature (part 2). Fig. 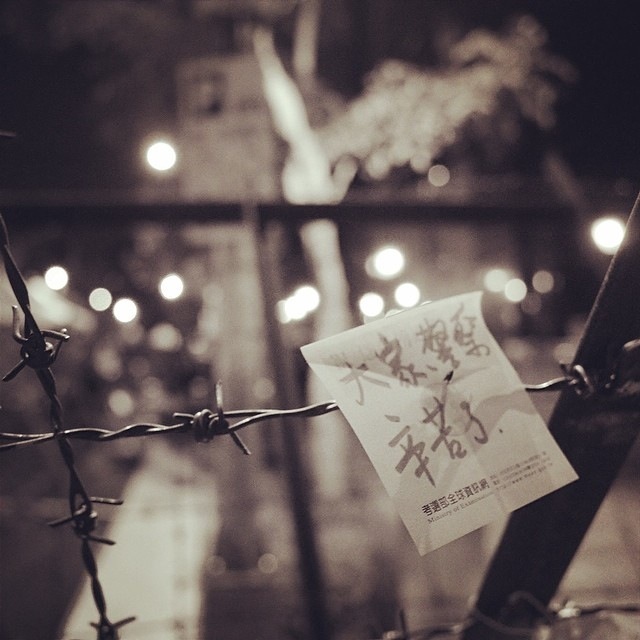 1 A note reading “Everyone, police, thank you for your struggle” hangs on a barbed wire barricade. An emphasis on unity between the police and the people has emerged as a core element in the struggle by Taiwanese protestors to control representations of their movement. Where the Presidential Office has sought to describe them as a “Violent Mob,” they have successfully asserted the peaceful qualities inherent in the sympathetic bond that stretches across the barricades, uniting them with the rank and file policemen called up to contain them. Fig. 2 Protesters form a channel and applaud police leaving their shift. This is an interpretation that locates the source of potential violence at the top of the executive chain of command, i.e. in the Presidential Office. In line with this interpretation, a video has been circulated purporting to show two incidents in which commanding officers attempt to provoke violence between peaceful protesters and sympathetic rank-and-file police. the politically risky burden of figuring out which order to follow will be borne by field officers exposed to two contradictory commands. Taiwan’s erstwhile authoritarian policing system used dedicated “Bao An” units garrisoned around the island as a specialized riot control force. These units were recently downsized, with anti-riot capacity made a supplementary function of regular administrative police. The rank-and-file at the scene are thus regular beat cops deployed to anti-riot duty. This introduces an element of complexity into the command structure. For, in line with its democratic constitution, the police power in Taiwan is dispersed within the structure of the polity. Local police departments are under “simultaneous” control by local governments and the centralized bureaucracy that culminates in the Ministry of Interior. The ambiguity of this dual oversight weighs heavily on politically charged operations. 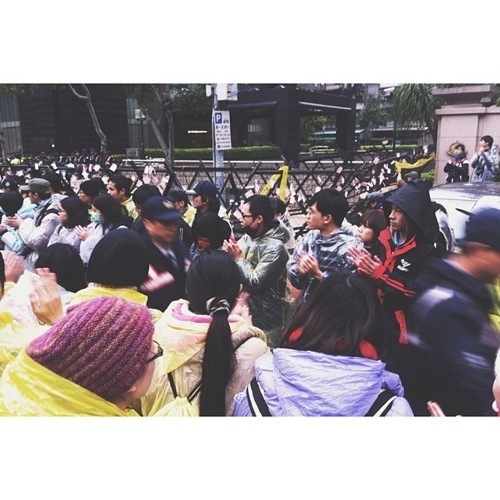 A good example, in the present case, was the declaration by Kaohsiung mayor Chen Chu that she would not allow any police from her city to participate in a forceful suppression of the students. If Kaohsiung police happen to be present at the scene when a command comes down from the center to act, the politically risky burden of figuring out which order to follow will be borne by field officers exposed to two contradictory commands. One might expect a presidential order to ultimately overrule a mayor. But in Taiwanese political arena, that is not necessarily a safe bet. Dealing with the political dimensions of institutional incoherence in Taiwanese police operations is a specialty of a kind of figure I have described elsewhere as the “Outlaw Legislators.” In this case, the key figure is the king of all Taiwanese legislators, outlaw and otherwise, Wang Jin-ping, who has served as the elected president of the legislative assembly since 1999. 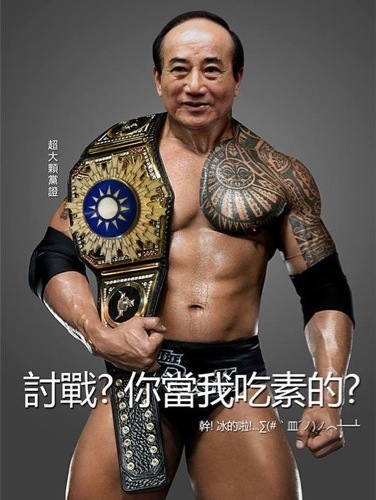 Photoshopped picture depicting Wang Jin-ping as a political gladiator. As president of the legislature, he is formally vested with the “police power” to maintain order inside the legislative hall. The continued occupation of the building is directly related to his tolerance for this occupation. Wang’s remarkable tolerance can be best understood in the context of his ongoing struggle with President Ma, which escalated to a sort of life-and-death battle in September of 2013 when Ma initiated legal proceedings against Wang. Ma produced wiretapped evidence, obtained by the country’s chief prosecutor Huang Shih-ming, that Wang had attempted to interfere in the prosecution of another legislator. A conviction would have stripped Wang of his position and Wang fought back with everything he could. Wang’s victory (obtained just last week) has been nothing short of total. The evidence of Wang’s malfeasance was illegally obtained, and Wang’s countersuit resulted in Huang Shih-ming, the country’s chief prosecutor – rather than Wang – convicted and facing jail time! Taiwan’s legislative body is not just a place for making law. It is the epicenter of all political networks on the island, the central clearing-house for political conflicts that cannot be contained in local context. As Wang’s victory over the president and chief prosecutor shows, the role of law and procedure inside this political arena is complex and unpredictable. The occupation of the legislative hall by dissident students is historically unprecedented. But there are abundant precedents for staging “street” politics in the legislative arena, such as the frequent fistfights between legislators which have been a notorious feature of Taiwanese democracy since the beginning of the transitional process. The students now inside the hall are idealists, appealing to Taiwan’s common commitment to the idea of democracy against the darkness and complexities of political dealmaking. Deals are being cut to throw open a door to Chinese communist capital. This door, by the student’s reckoning at least, threatens to open a Pandora’s box that will be impossible to close. Thus the process by which it is opened deserves a more inclusive and transparent discussion. ← Policing an Occupied Legislature (or “Institutional memory will get you through a time of no constitution better than a constitution will get you through a time of no institutional memory”). Great observation Kevin. It’s “xinkule,” a euphemistic exhortation commonly made in recognition of someone else’s efforts. It literally means something like bitterness, toil or suffering. It is unrelated to any word for antagonistic struggle, so might actually be better translated in some other way, maybe “Thank you for your suffering…”? So, what about question #2? If something is being “shared” across the line of not/police, what is it? Is it a mutual taste/sensation (bitterness)? Is it a shared structural position (toil)? It is a shared fate (suffering)? Kevin: I think the overall strategy here is an appeal to a common “Taiwaneseness” connecting police and protesters (If I could figure out how to post pictures in comments, I just got a neat picture of a poster showing a man opening up his police uniform to reveal a picture of Taiwan on his chest, ala Clark Kent/Superman, with the slogan “Police vs. Students: under the uniforms, we are all Taiwanese”). What exactly this particular Taiwaneseness amounts to, as far as a subject position relevant to this particular moment of political process, would be an interesting question to explore, in exactly the categories you are proposing here. Do you believe there is a different dynamic in how the police are interacting with the students versus the routine interactions they have with older full time activists (ex. Alliance for Referendum, 908 etc) or are there more convergences? Hi Derek! I don’t know. It would be interesting to explore. There is certainly a constant process of institutional learning going on, on both sides of the police/policed relationship. The relationship between new/old activists is a very interesting topic, beyond my capacity to comment on, beyond my vague sense that ‘kids these days’ seem pretty determined to make their own way in the world. Having done my MA fieldwork with the older activists at the organizations I just mentioned in 2012, they would often tell me that “kids these days”, as you say, were overwhelmingly “brainwashed.” On one level, it was based on the perception the full time activists possessed more 行動力. The focus of the younger generation, many said, on study and looking for jobs meant they did not have time to camp out, as these older activists did, in opposing the government. One man described his participation to me as a “sacrifice” removed from those concerned with merely making a living. It is important to remember that the older activists I am referring are not party elders, but rather a quite varied mix of mostly retired supporters for whom engaging in independence activism is a Monday to Sunday cycle of teach-ins, lectures and the regular rhythm of major political events. While I followed this over a summer, the anti-media monopoly movement was gaining steam. Asking around my informants about the rising tide of youth activism, I encountered skepticism. Even when students were active, they complained, they were still “brainwashed” because they did not fully embrace a project of terminating the ROC. The reason I ask about relationships to the police was that I was never quite able to figure out the dynamics they had. Each rally that either 908 or the Alliance held came in pairs. For example, 908 would have about a dozen people. The activists would stand on one side and hold a press conference, a dozen or so police would stand on the other. Sometimes, police outnumbered the activists, and if it were not for the occasional news camera, you would think that the main audience for these regular lectures (about the legal status of Taiwan, the Ma administration, Chen Shui-Bian’s treatment etc) were in effect the police standing there themselves. Indeed, one sight that sticks with me is how at rallies, even after the main group of activists would leave, there would often be one or two individuals who would stay behind in front of the police lecturing them. Given that these officers cannot not listen, I often wondered what they were thinking. This is what makes me so curious about the current situation. Unfortunately, given how I was situated during fieldwork, I never felt it opportune during these demonstrations to go up to the police and start talking to them. That’s why I thought you might have some perspectives from the “other side”. If I may, I would strongly suggest personally “being in Taiwan” when trying to address what’s going on “in Taiwan”. The biased/insufficient/official/nonexistent “journalistic” reporting (locally and abroad) that has taken place since 3/18 is indeed NOT representative of the actual situation on the streets (literally) and inside the Legislative Yuan. The nonviolent struggle of the young people of Taiwan, and their many supporters, is nothing short of breath-taking and commendable in scope, resolve, focus, and commitment to compassion, community and ahimsa.